LAS VEGAS, Nevada — Resurrection Fighting Alliance (RFA) president Ed Soares announced today that the promotion will be returning to the state of South Dakota in April with a stacked card. 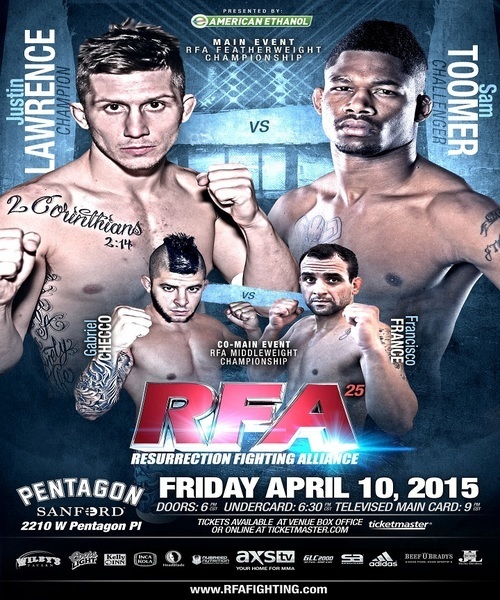 RFA 25 – Lawrence vs. Toomer will feature a main event between two RFA fan favorites. RFA featherweight champion Justin “The American Kidd” Lawrence returns to the building that he won his title last summer. His first title defense will be against #1 contender “Super” Sam Toomer, who will be looking to keep his undefeated record intact. In the co-main event, Gabriel “Zangief” Checco meets fellow Brazil native and RFA vet Francisco “Kiko” France for the middleweight title. The event takes place Friday, April 10th at the Sanford Pentagon in Sioux Falls, South Dakota. The entire main card will be televised live and nationwide on AXS TV at 10 p.m. ET / 7 p.m. PT. Tickets for RFA 25 – Lawrence vs. Toomer are available for purchase NOW through Ticketmaster.com or by calling 605.312.7900. Ticket prices start at $25, reserved seating is available for $30-$40, and cageside seating is $125. Lawrence (6-2) returns to the site of the biggest win of his career. Last August at RFA 17, the 24-year-old striking stalwart captured the vacant RFA featherweight title by besting Mark Dickman via Unanimous Decision in what was South Dakota’s very first sanctioned MMA world title fight. The win was Lawrence’s second straight victory since joining the RFA. 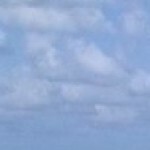 Before that he had gained worldwide notoriety as a star on the fifteenth season of the UFC’s hit reality show The Ultimate Fighter, where he was the first overall pick. On the show, Lawrence recorded highlight reel KO’s of RFA alum and current UFC star James Krause as well as PRIDE vet and eventual UFC fighter Cristiano Marcello. Lawrence, a former two-time Golden Gloves champion and decorated kickboxer, only had a 3-0 record in MMA at the time, but reached the quarter-finals before earning “Fight of the Night” and “KO of the Night” bonuses for his vicious KO of John Cofer in his UFC debut. Lawrence, who fights out of Alliance MMA in Chula Vista, California, is eager to once again showcase his vaunted striking skills in his first RFA featherweight title defense. Toomer (9-0) will be the man challenging Lawrence for RFA gold. Unlike most top mixed martial artists, like Lawrence, who come from grappling or striking backgrounds, Toomer was a lifelong football player. However, the 27-year-old college football defensive back has made a successful transition to MMA by utilizing his natural athleticism, discipline, and unbreakable work ethic to compile an impressive 9-0 record since making his pro debut three years ago. Two of those wins have come in the past eight months after Toomer signed with the RFA. Toomer won his RFA debut at RFA 15 in June with a dominant performance. The one-sided fight saw his opponent Daniel Aguiar get disqualified in the third round after refusing to stand and fight Toomer. The DQ win over Aguiar via timidity put Toomer’s name on the RFA featherweight map as a legitimate title contender. In December, Toomer solidified his case for a title shot with a valiant comeback win over Lyoto Machida protégé Altair Alencar at RFA 21. Toomer, who fights out of The Arena MMA in San Diego, California, is now gearing up for the biggest undertaking of his athletic career in April, as he challenges the highly-touted RFA champion Lawrence for his title. The co-main event of RFA 25 will also feature a title fight between two accomplished RFA vets, who happen to both hail from Brazil. Gabriel “Zangief” Checco (8-1) made his international debut in October in the main event of RFA 19. After coming up short in his first bid for the RFA middleweight title that night to Jake Collier, who was immediately signed by the UFC, Checco rebounded in a big way earlier this month at RFA 23. He made a huge statement with a blistering first round knockout of the highly-touted The Ultimate Fighter 11 cast member Joseph Henle. Checco will now face his fellow countryman and fellow jiu-jitsu black belt Francisco “Kiko” France (11-3-1) for the title. France enters the fight with a ton of momentum after steamrolling his first two opponents in the RFA. Last August, in the RFA’s first trip to South Dakota, France submitted local standout Isaac Appel with a first round Kimura. He followed up that success with another first round finish at RFA 21 in December. He made his case for a title shot that night by dispatching Bellator vet Mikey Gomez with a first round Arm-Triangle Choke. RFA 25 will mark the return of two more RFA vets in the flyweight division. Abel “The Silent Assassin” Cullum (20-6) will be dropping down to 125-pounds for the first time in his storied MMA career to face Sioux Falls native Josh “The Rage” Rave (24-11). Cullum made a storybook comeback this past fall after a three year hiatus from the sport. In his RFA debut at RFA 18, Cullum submitted UFC vet Ulysses Gomez in 89 seconds. Four weeks later at RFA 19, he submitted top prospect Carl Deaton III in the second round. Cullum now drops down to the flyweight division to face Rave, who is the most accomplished flyweight MMA fighter in South Dakota history. Rave will also be riding momentum heading into this fight. He has won three of his last four bouts since making his RFA debut at RFA 2. In the lightweight division, RFA 25 will feature the return of T.J. “The Carnivore” Hepburn (4-0), who is a longtime RFA fan favorite. He is also the 2012 NCAA Division II wrestling national champion at 157 lbs. Hepburn will face a fellow undefeated lightweight prospect in LaRue “The Cannibal” Burley (5-0), who will be making his highly-anticipated RFA debut. Burley is widely known as the man who gave blue chip MMA prospect Bubba Jenkins his first loss in MMA. Jenkins coincidentally fought on the same RFA 3 card as Hepburn and is the 2011 NCAA Division I wrestling national champion at 157 lbs. The main card will also feature Anderson Silva protégé Khalil “War Horse” Rountree (2-0) in about against against Roufusport prospect Cameron Olson (2-0). The preliminary card is also loaded. Local fan favorites and RFA vets Jordon Larson (5-1), Devin Clark (3-0), and Devin Turner (2-2) are returning to fight on the RFA’s highly-anticipated return trip to their hometown of Sioux Falls, South Dakota. Larson defeated Donavon Winters in his RFA debut at RFA 17 in August in a highly entertaining welterweight bout. He will face Jarrod L’Heureux (7-1) in an eagerly anticipated rematch. All seven of L’Heureux’s wins have come via submission with his lone loss coming against Larson. Clark, Larson’s teammate at Next Edge Academy in Sioux Falls, also won decisively at RFA 17. The light-heavyweight powerhouse won via TKO over 2012 NFL draft pick Aaron Brown. Clark will face Omaha based fighter Jaquis Williams (5-2). Meanwhile, Turner will look to pick up his first RFA win against RFA vet and highly-touted MMA prospect Matt Lopez (4-0) in a 140-pound catchweight bout. The entire main card of RFA 25 – Lawrence vs. Toomer will be televised live on AXS TV starting at 10 p.m. ET / 7 p.m. PT on Friday, April 10th. RFA 25 will be the promotion’s second event in the state of South Dakota after hosting the first sanctioned MMA event in “The Mount Rushmore State” last August. More fights on the RFA 25 fight card will be announced in the coming weeks. Please visit RFAfighting.com for bout updates and information. RFA is also on Facebook atFacebook.com/RFAfighting, Instagram at @RFAfighting, and Twitter at @RFAfighting. RFA is a professional mixed martial arts promotion that gives rising stars and top contenders the opportunity to prove their talent to fans and leaders in the industry. The RFA presents up to 12 events annually around the United States including Las Vegas, Los Angeles, Denver, and Minneapolis. RFA can be seen live in over 42 million homes nationally through its television deal with AXS TV. Based in Las Vegas, Nevada, RFA is one of the most active and respected MMA organizations in the fastest growing sport in the world. (The Octagon, Ultimate Fighting Championship®, UFC®, and the eight-sided competition mat and cage design are registered trademarks owned exclusively by Zuffa, LLC. All rights reserved).